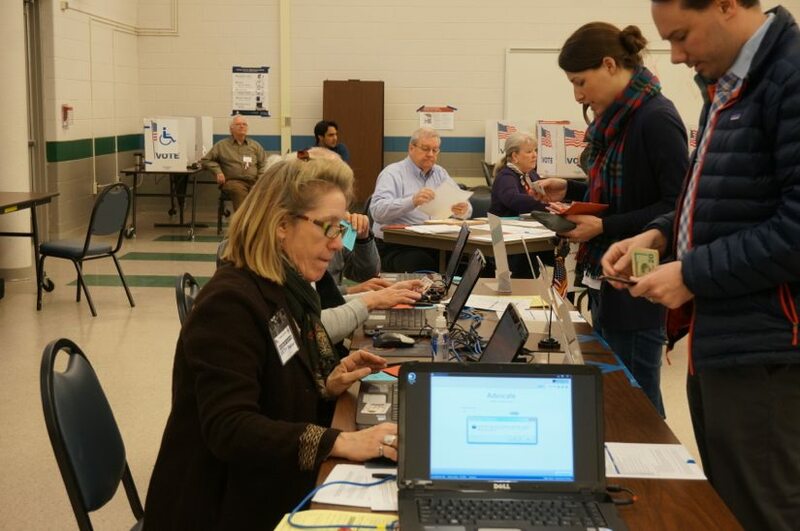 Super Tuesday in Reston started warm (for March 1) and sunny — and with voter traffic similar to a general election, said Fairfax County polling officials. Fairfax County polls opened at 6 a.m. and will be open until 7 p.m. Eleven states, including Virginia, will cast ballots in 2016 Presidential primaries or caucuses today. By 8:30 a.m., 312 voters (200 Democrat ballots; 114 Republican) had been through Reston’s largest precinct, at South Lakes High School. At the new North Point precinct at St. Thomas a Becket Church, 316 voters cast ballots (175 Republican; 141 Democrats) by 8:50 a.m.
A random survey of voters at both polling places, as well as the polling place at Langston Hughes Middle School, showed Restonians are supporting a variety of candidates. Ned Dickert, casting his ballot at SLHS, showed off his blue tie and shirt. At North Point, lawyer Cathy Ruse said Ted Cruz has her vote. “He is the most consistent conservative,” she said. Joe Ingrisano said John Kasich has his vote. Another voter who did not want to give her name, also said she was tired of the negative campaigning. In Fairfax County, there will be two primaries held in each poll location. Registered voters can vote for either a Democratic candidate or a Republican candidate, but not both. You do not have to be registered by party ahead of time. The Presidential Primary ballots were printed in advance of absentee voting, which started in January, so ballots will contain names of some candidates no longer in the race. Here is a Democrat sample ballot. Here is a Republican sample ballot. Not sure where your polling spot is? Visit this online tool on the Fairfax County Board of Elections website. In Reston, there have been a couple of changes since the last election. The Terraset precinct polling place has been moved to Langston Hughes Middle School. There is also a new district in North Reston. A new precinct at Armstrong Elementary was created by dividing Aldrin and North Point precincts. The northern portion of North Point precinct combined with the northern portion of Aldrin will retain the name “North Point,” with polling place at St. Thomas a Becket Catholic Church, 1421 Wiehle Ave., Reston. The southern portion of Aldrin retains the name “Aldrin” and polling place at Aldrin Elementary School. Reston Now will have local precinct results when they come in after 7 p.m.
Photo: Super Tuesday voters check in at South Lakes High School polling place.